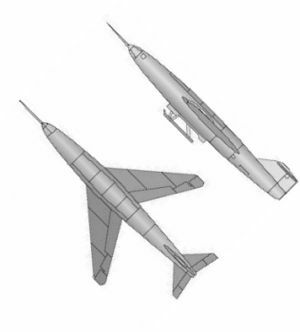 Russian manned rocketplane. 4 flights from 1946. Post-war Soviet version of the German supersonic DFS 8-346 rocket reconnaissance aircraft. Abandoned in 1951 after the prototype crashed. Status: Cancelled 1951. Gross mass: 5,230 kg (11,530 lb). Unfuelled mass: 3,330 kg (7,340 lb). Height: 13.45 m (44.12 ft). Span: 9.00 m (29.50 ft). OKB-2 was formed 22 October 1946 in Podberzye for development and exploitation of German rocketplane technology. Soviet director was A Ya Berznyak, and chief designer was German engineer Hans Roessing. OKB-2 was tasked with continued development and flight of the German supersonic DFS 8-346 rocket reconnaissance aircraft. The 346 featured a 45 degree swept wing, a prone pilot looking through a Plexiglas nose, and a dual-thrust Walter HWK 109-509C engine. Maximum speed was to be Mach 2 after a two minute rocket burn. Wind tunnel tests began at TsAGI in March 1947. Four 346 aircraft were built. As with the American XS-1, they were launched from captured B-29 or Tu-4 bombers. German pilot Wolfgang Ziese conducted all of the initial flight tests. Following initial glider flights (346P, 346-1) in 1948, the first powered flight of the 346-2 came on 30 September 1949. The flight was successful but Ziese was injured after the landing skid collapsed after a fast landing. Following repairs, 346-2 flights continued in October 1950 with Russian pilot P I Kasmin at the controls. Ziese resumed flight with the final version, the 346-3, on 15 August 1951. This flew again on 2 September but the aircraft went out of control on 14 September and Ziese bailed out of the aircraft. The destruction of this rocketplane resulted in further tests being abandoned. All German engineers were repatriated to East Germany and OKB-2 dissolved by the end of 1953. Family: Rocketplane, Suborbital. Country: Russia. Agency: VVS, Isayev bureau. Bibliography: 301.